I'm not usually one for boycotting anything. Boycotts are usually some phony political movement that's designed to make everyone feel like they're accomplishing...something. 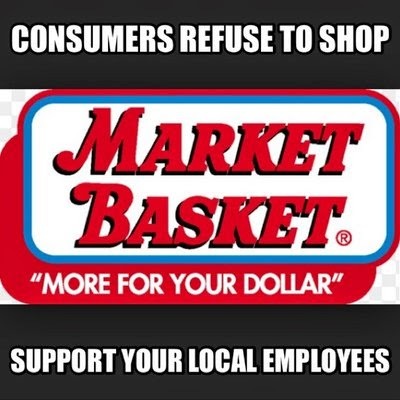 But in this case, I am boycotting Market Basket, I am supporting the workers and the ousted president, Arthur T. Demoulas. For those of you who aren't familiar with Market Basket and the story behind what has gotten us to this point, please read here. Market Basket is now the company name of a regional chain of supermarkets originating in Lowell, Massachusetts. Formerly known as Demoulas, named after its founder Arthur Demoulas, Market Basket has grown into one of the largest privately owned grocery chains in the nation. Known for their low prices, Market Basket has become a reliable place to shop without having to worry about any games, membership cards or gotcha deals. 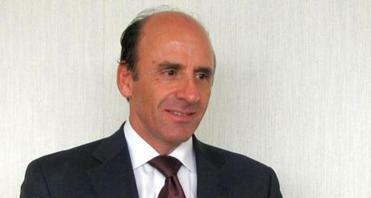 There are two heirs to the company's fortunes, Arthur S. Demoulas and Arthur T. Demoulas. (Yes, they are named after the founder) Arthur T. is beloved by long time employees, some with over 50 years with the company. Arthur S. is all about profits and many believe he is trying to sell the company. For quite some time, Arthur S. has been trying to oust Arthur T. Last year, the board of directors narrowly voted to keep Arthur T. as president to the joy of the many long time employees of the company. This year, however, the tables turned and Arthur T. was finally deposed.Several long time employees walked out after Arthur T. was fired in protest. The company brought in two CEOs to replace Arthur T., Jim Gooch former CEO of Radio Shack, and Felcia Thornton, former CEO of Knowledge Universe to replace Arthur T.
Here's Forbes Magazine's take on Gooch, by the way. Calling his loss Radio Shack's biggest gain as the company took a huge nosedive in 2012 while Gooch was at the helm. Thornton resigned from Knowledge Universe in June 2011 for personal reasons, according to reports. Sounds like a real dynamic duo. Workers protested the firing and subsequently staged a protest outside the company's headquarters in Tewksbury, MA. As a result, deliveries were stifled any many stores ran out of product. Predictably, Gooch and Thornton reacted by firing long time warehouse leader Dean Joyce and district manager Tom Trainor and predictably, more firings will follow. What is going on here is amazing. For the first time I can recall on this scale, workers are loyal to a man who they view as an honest leader with their best interests at heart. You don't see or hear that too often. These people are willing to lose their jobs rather than sit by and let Arthur S. Demoulas destroy what Arthur T. has built. Gooch and Thornton are doing the dirty work putting themselves in the crosshairs of public disdain when the real villain in this story is none other than Arthur S. Demoulas. 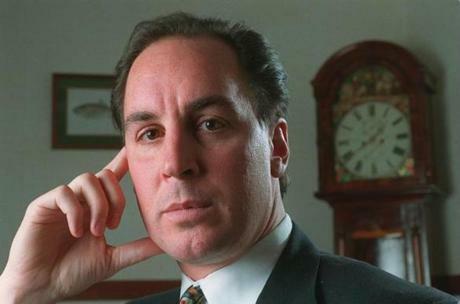 If Arthur S. was the sole proprietor of Market Basket and saw fit to setup the company to be sold, that's certainly his prerogative, which is obviously the end game now that he has full control of the company. But what he's done is not only steamroll his cousin, he's ignored the backbone of the very empire he oversees, the employees and chosen to push them aside in order to fatten his wallet. I have no doubt that both Arthur S. and Arthur T. are very wealthy and could live comfortably for the rest of their lives right now if the whole thing collapsed. Arthur T. is all about taking care of his employees and his customers. Arthur S. is all about greed. This is the essential issue that is plaguing this nation right now. For too long, too many companies have seen profit and a fat balance sheet as more important than a happy work force and happy customers. The American worker has been cast aside as a spare part that must be replaced once a certain salary or age has been reached. But it's not just greedy businessmen who are guilty, workers for their own part have also contributed to the demise of employment in America. For far too long, workers have demanded more from employers and expect to do less. there are far too many workers who perform well below their capabilities and feel they are owed something without earning anything. This is disgraceful and has dragged our country down. There needs to be a balance and Arthur T. Demoulas obviously found that. 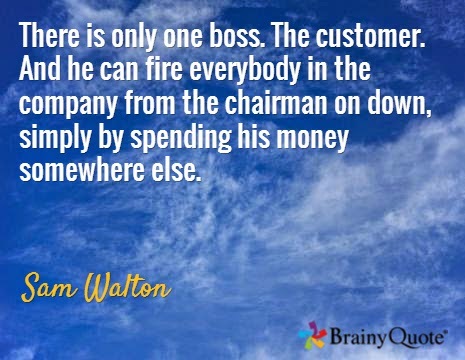 He not only created an environment where customers were happy with his stores, he created an environment where his employees are so loyal they are willing to walk away from their jobs for him. This issue has galvanized people where now even local politicians are supporting boycotting the stores. It doesn't matter whether you are liberal or conservative, this fight is about what's right. And what's right is boycotting Market Basket. What wins this fight is not Arthur S. or Arthur T. Demoulas, the board of directors, the CEOs or even the Market Basket employees. What wins this fight is the customer. By not setting foot inside Market Basket you have the power to send a message to Arthur S. Demoulas and his greedy board of directors, you send a message to the rest of corporate America that you will not be bullied and you will not stand by and let a wrong like what has happened to Arthur T. Demoulas and his employees happen. 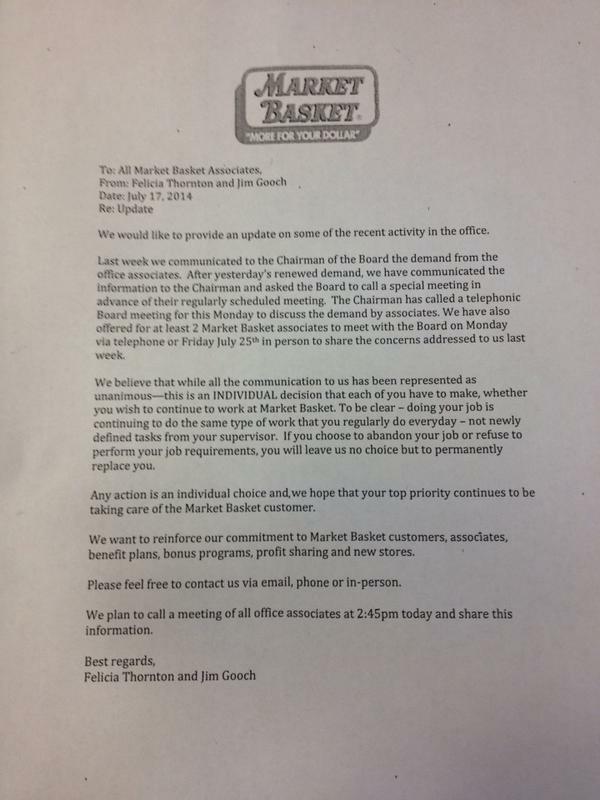 Quote from Market Basket CEOs Jim Gooch and Felicia Thornton: "If you choose to abandon your job or refuse to perform your job requirements, you will leave us no choice but to permanently replace you." Memo to the new CEOs and the board of directors of Market Basket: "You have chosen to fire Arthur T. Demoulas and now have decided to terminate several employees, you have left us no choice but to permanently replace you." Send a message, boycott Market Basket. Arthur T- Was mentored by his father from his early teenage years until his Father's passing in 2003 on how to run and grow this business. He is an exceptional leader who has on many occasions gone above and beyond for his employees and built a relationship of trust and dedication with the many associates who work for Market Basket. His Associates recognize that he has time and again looked out for their best interests and built a model business in a competitive environment and achieved success. Arthur S - As a teenager I worked at Demoulas Store 14 the last store his Father opened prior to his death. I remember an arrogant young man who would show up stoned and walk up and down the aisles. When his side of the family was suing his Cousins side he was quoted as saying " I just want to run the store my father built". Since the award he has never walked in a store again and if asked for the store locations he could not find them with out the aid of GPS. He is a man of many words and no actions other than those that benefit him alone. Prideful, arrogant and selfish are the best words I can use to describe him. I can only hope for the 25,000 Associates at Market Basket that the other members of the prevailing majority member ship understand what they have to lose if this continues. Their best opportunity is to take he offer that their cousin has for them. They will not get a better offer from any other suitor. No one wants to buy half a business and especially one is a complete down fall. There is no value here at the moment goodwill and profitability are going to be under extreme pressure and unless the ruling family wants to sell at a huge discount and quickly they look to have a long battle on their hands and no capable leader to find a safe harbor. This is a sad ending for a great success story, I can only hope that Arthur T succeeds here and I can only feel regret for T & G Demoulas when they were building their small empire from one store to fourteen together did they ever thing that their dream would tear there family apart. I grew up next to a Greek community as a boy and my memories are full of the close family ties many of my boy hood friends who were from that neighborhood who had loving large extended families. Lets hope at the end of the day calmer heads prevail and this very successful company will get back on track and continue to enjoy prosperity. I couldn't agree more with the above. As a Massachusetts native now living in NH, I have shopped at Demoulas stores all of my life and have known several people who have worked there and been exceptionally happy with their jobs. This is definitely a dispute between those who work (including the 25,000 employees as well as Arthur T's side of the family, who have long been known to be the "working" side of the family) and those who think they're smart because they had the foresight and good judgment to be born into a family that would bequeath them money and property. WHY DIDN'T I THINK OF THAT? Obviously I ( and those 25,000 employees) are just not that clever! But, as brilliant as Arthur S.'s side of the family believes itself to be -- it's kind of amazing that they think they can make money in a business that has hardly any customers and no hope of obtaining a workforce that is committed to the success of the business. I guess that they're getting a little confused about where money comes from at this point. After you're all done inheriting that first bundle of cash, there's only one way to get more: Persuade customers to trade it for goods and services. Entice employees to earn it by providing the quality and quantity of goods and services that customers want, need, and value. Otherwise, the money tree withers up and dies. Who knew? If Money Making 101 is subtitled "Inherit it," Money Making 102 subtitled, "Recruit and retain customers and employees." Remedial Money-Making is obviously subtitled, "Sell your shares while someone's still willing to pay for them." I'll stick to the boycott as long as it takes. And all of the locals that I know -- regardless of their political leanings -- are doing the same. I hope Arthur S. et al's urge self-preservation overcomes the stupidity and disproportionate animosity that's driving this. The last smart thing these people did was to be born into a family that had money. Let's hope they rediscover the brilliance that drove that move and get out while the getting's good.